As a child, one day I was walking past grandma's bedroom when I saw her kneeling at her bed, Bible open, head turned up like an overflowing cup and her hands lifted in the air. I was shocked and surprised. Normally she prayed with her head bowed and her hands folded in a very subdued manner. At mealtime and at church, this was her style of worship; so this was new for me and different. I asked her about it and she simply said: "bathing butterflies hold their wings up." It has taken me years to decipher her meaning. True enough; when a butterfly lands on a pond, it holds up its wings, as sails, to skim over the surface. Granny was sailing on a pool of praise and catching the winds of the Spirit. Even then, I could catch a glimpse of the inner beauty that shined through her wrinkled face. I have no doubt that as she lifted her hands and her heart to God she was including me in her prayers. Whatever serenity and smooth sailing I have experienced is somehow mysteriously connected to those bedside intercessions. Decades later, the memory of it still inspires me to be and to do my best. In my church indoctrination, I have been trained not to get too exuberant. Maybe an "amen" once in a while but let's not get carried away. That doesn't stop me, however, from letting my spirit soar on the inside. As I told a friend: I may be sitting on this pew with my hands folded on my lap looking very dignified. But if you could see my spirit soar you would realize that, like granny, I'm holding my wings up for the slightest spiritual breeze that may be moving through the congregation. The Old Testament got it right when it says: "I will lift up my hands and call upon your Name" (Psalm 63.4). "Lift up your heads... that the King of glory may come in" (Psalm 24:7). Recently I had a stroke. I call it my stroke of good luck. The doctor told me that the blood clot reached the right side of my brain and impaired some of my cognitive functions. The left side, where most of the emotions reside, had taken over. Lucky for me; as a result I feel my faith now. Perhaps, for the first time, like granny, I finally got religion. Thank goodness, it doesn't take a stroke to get there. When you have gone as far as logic can go, take a leap of faith into the arms of love. Your right brain will tell you this is silly, this is not logical. 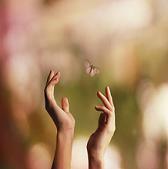 Surrender to your left brain and you may discover the lesson of bathing butterflies. Article By Marshall Hoffman, a retired minister and chaplain, is on a mission to motivate believers to love God more and serve him better. The biblical insights he freely shares come from over 50 years of ministry. Check out his daily devotions, holy humor, bible studies and sermons at http://www.gleaningsfromscripture.com.